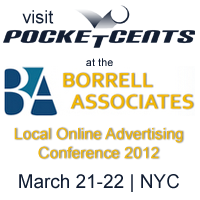 PocketCents Will Be Speaking About Local Online Advertising Partnerships at the Borrell Local Online Advertising Conference in New York City, March 21-22, 2012. PocketCents Local Online Advertising Network will be speaking Thursday, March 22nd in the Borrell BUZZ Session, at the Borrell Local Online Advertising Conference. PocketCents will be releasing local network data in a case study that shows the importance of retaining a local mindset in web publishing. PocketCents is boasting higher click-through-rates when executing local targeting methods, and will present the results during this event. PocketCents is seeking media companies and news organizations, as well as ad feeds and XML ad networks, to peruse partnership opportunities in local advertising. Learn about Local Advertising Partnerships with PocketCents at Borrell’s conference next week. “In a recent study released by ComScore, 31% of online advertisement impressions went unseen. This really shows the advantage of performance-based, pay-per-click advertising.” - Phil Kanaby, CEO PocketCents Inc.
PocketCents will be speaking about local online advertising partnerships at the Borrell Local Online Advertising Conference next week. The conference is set for March 21st and 22nd, and will be held at the Grand Hyatt Hotel in New York City. The Borrell Associates are one of the leading marketing intelligence firms, and their conference attracts an impressive assortment media and digital publishing companies. PocketCents is reaching out to both ad networks and ad publishers to exhibit exactly how and why they should consider local online advertising. PocketCents will discuss increasing click through rates, maximizing revenue generation, and best tactics for partnering with PocketCents. PocketCents has three major partnership opportunities, the first one of which is for online ad publishers. Publishers are websites, digital news publications, apps or blogs that are trying to monetize their traffic with advertising. Using local targeting, PocketCents offers a flat-rate payout for clicks, higher CTR, and significant revenue generation advantages for publishers over other systems. PocketCents shares the industry standard 60% with the publisher for their clicks, and the flat-rate payout translates to significant earning potential for publishers. The second type partnership available is for ad networks. Ad networks can utilize PocketCents technology to distribute their ads on the PocketCents network. PocketCents can distribute national, international and local ad feeds to thousands of publisher websites. PocketCents can easily incorporate API and XML feeds utilizing provided ad information to target specific demographics of consumers. Innovative keyword technology improves compatibility with network integration. Additionally, PocketCents has a low-flat rate which facilitates doing business with most networks. The third type of partnership is called co-registration. These partners are websites with advertising space, and they also have their own advertisers who utilize this space. Many websites utilize their own advertising to generate revenue, but they often rely on external marketing to increase traffic to their content. Other times they may want to increase the size of advertising budgets than they can fill. Co-registration’s goal is to provide a solution that generates ad revenue and increases traffic to partner websites simultaneously. Partner websites are no longer limited to their own resources to expand. They can leverage the PocketCents network using their own advertisers to expand their user base. Partners share ads and advertisers with PocketCents, and PocketCents supplies traffic and revenue to the partner. PocketCents is excited to be presenting at the Borrell Local Online Advertising Conference next week. Local online advertising is the foundation of the PocketCents system, and PocketCents looks forward to connecting with other industry leaders. Local is taking up an increasing portion of the online advertising market each year, and PocketCents is attempting to create local advertising partnerships to accommodate this growing market. PocketCents hopes that, together, they can secure market as it shifts by delivering exactly what it wants, truly local online advertising. PocketCents, Inc. (http://www.pocketcents.com) is a local online advertising network that specializes in pay-per-click targeted advertising and connects local advertisers with publishers who post local ads. PocketCents publishers earn ad revenue from local ads, and with flat-rate payouts, it is easy to estimate ad revenue from PocketCents. PocketCents has publishers in the U.S. and all around the world displaying millions of ads each day. Additionally, PocketCents has a variety of ad media types to generate revenue that include banner ads, local digital coupons, pop-up local videos, and mobile.